Yes, there were sensations aplenty at the Sonoma County courthouse that December, 1910, as the PD reminded us constantly in the headlines. “DAY OF SENSATIONS IN THE TRIAL OF DR. W. P. BURKE,” was at the top of the front page one day. “SENSATIONAL EVIDENCE GIVEN AT TRIAL OF DR. BURKE” read another headline, and buckets of ink were used to announce “EACH DAY UNFOLDS NEW SENSATIONS IN THE TRIAL OF DR. W. P. BURKE.” The articles found under these hyperventilated headlines weren’t quite as twitchy, but they certainly offered more colorful writing than previous trial coverage in the Press Democrat, which had been a model for restrained and impartial court reporting. Dr. Burke’s Defense Attorney Rollo Leppo continued his cross-examination of Lu Etta. She denied threatening suicide or to kill her baby. She conceded she may have once said, “I wish I was dead,” but denied she added, “If I had the means I would soon make it a fact.” She denied “illicit relations with other men” and Leppo pressed hard to introduce questions that would suggest she was promiscuous. Judge Seawell shot down his attempts to ask about her “love imaginations,” including that supposedly she said she was “violently in love” with a professor at UC/Berkeley “whom she was communicating with via telepathy.” Lu Etta did testify that she had written several times to Wilson Fritch, “a lecturer on a ‘new thought’ said to incline to the teaching of Dr. Burke’s philosophy of love,” and arranged for him to speak at Burke’s Sanitarium. “Did you ever tell anybody that your child was born of immaculate conception?” asked Leppo. “I did not,” said the witness warmly. “Where is that letter?” asked Leppo. “Who destroyed that letter?” demanded Leppo. “I did not,” quietly replied the woman. Leppo did not press for further explanation of what she believed (or what she thought Dr. Burke believed), for which the courtroom was probably deeply grateful. The Press Democrat tried to make some sense of her notions in a special sidebar, but ended up leaving Gentle Reader lost farther out in the weeds: “…Christ was the son of Joseph and Mary and the conception was both physical and immaculate, the latter on account of its spirituality. She at first believed the conception of her own child to have been immaculate, in the sense that it was upon this ‘higher plane,’ but later when Dr. Burke declined to properly care for the child she changed her mind…” Thanks, PD editor Ernest Finley, that was oh, so helpful. Although evidence suggests Derrigg consistently acted as a bagman in Dr. Burke’s efforts to implicate Lu Etta in the explosion, Smith testified she considered Derrig a good friend and a confidant who even “once offered me money with which to sue Dr. Burke.” Amazingly, there were apparently no followup questions to that remarkable assertion. Lu Etta said she wanted to go to Japan to avoid the trial, Derrigg gave her $750 total, including $500 on the day she sailed. Derrigg insisted she give the fake name of “Mrs. E. L. Long” for the steamer’s passenger manifest. 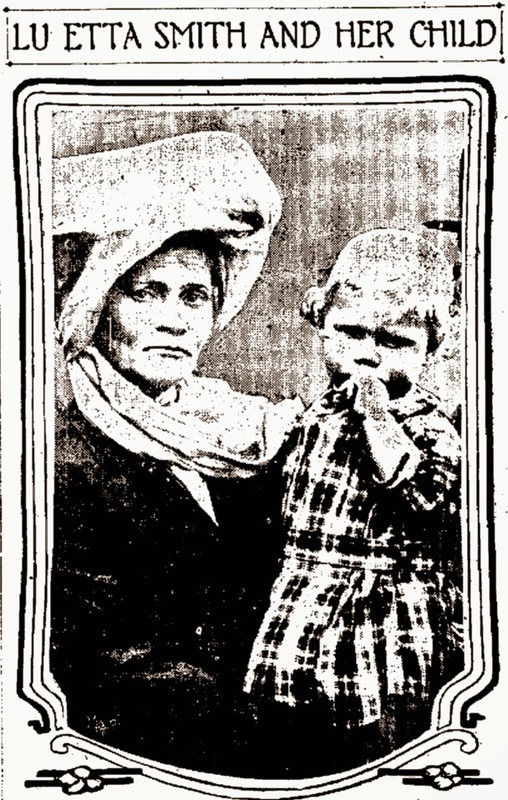 Mrs. Anna Macey took the stand and stated Lu Etta was at her boarding house in San Francisco for several months around the time Smith became pregnant. Dr. Burke was a weekly visitor, she said. The doctor’s visits were always about an hour long. “I know that he paid for her room and board while she was at my house. She had no income and I know she kept company with no other men while there. On the occasions of Dr. Burke’s visits he always went into her room.” She knew Lu was “in a delicate condition” when she left in Feb. 1909. Mrs. Macey testified that Frank Golden, a lawyer of San Francisco, and a relative of Dr. Burke, called at her house after the explosion with Mrs. Golden, who is a stenographer, and represented to her that he was “from the District Attorney’s office.” Later when the conversation was half over, Mrs. Macey testified that Golden told her who he was. Mrs. Macey further testified that when other people called subsequently and stated that they were “from the District Attorney’s office” she slammed the door in their faces, not caring for any further deception.